I wonder what you acutally consider as a good circadian rhythm? 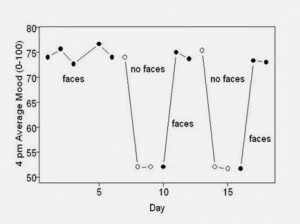 Getting up exactly when the sun rises and fall asleep at sunset? For three years I cannot fall asleep until 3-5am but then I have no problem to sleep for full 7 hours straight. Definitely out of synch though I get my dose of sleep but also seeing no progress for a endless list of health conditions. Even as a child I was so tired in the mornings that I would have to take a nap in the afternoon after school every day. Just bought the book and I will start to follow all recommendations soon. Thanks. – Getting at least 2 hours per day of sunlight or very bright blue light distributed over a 10-12 hour period. Maintain lights as bright as possible over the rest of the period. – Getting 10-12 hours of essentially no blue light exposure; ie use amber light bulbs and f.lux on the computer, or wear blue-blocking amber goggles. – Eating meals within or close to the period of bright light exposure. – Sleeping at a consistent time and to a natural waking during the period of darkness. – Physical activity within the bright day period — preferably 30-40 minutes every day. – Social interaction and engagement during the day. With the 2 hours of sunlight, do you mean out in sunshine? Do clouds or shade negate the positive effects of being outdoors? I think it probably does stimulate them, but I think it’s infeasible to avoid it. We often watch movies after dinner; it is not optimal for circadian rhythms I think, but it is optimal for our happiness. I would love to hear your response to this article which suggests that eating the majority of your calories first thing in the morning is better for weight loss and health. It seems to contradict the intermitent fasting theroy. It wasn’t testing intermittent fasting — it was comparing similar eating schedules with relatively more calories early than late, or late than early. Intermittent fasting is well supported. 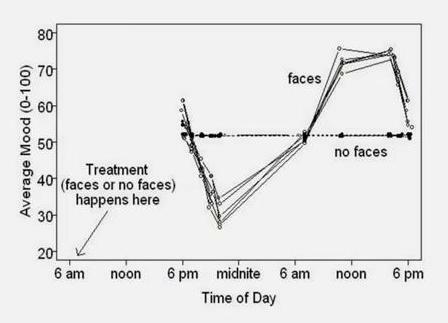 The comparable idea would be, should your feeding window be early in the day (ie 8 am to 4 pm) or late in the day (noon to 8 pm). This might support an early feeding window. But that is an extrapolation that is really hard to trust. I think an early feeding window would work well. 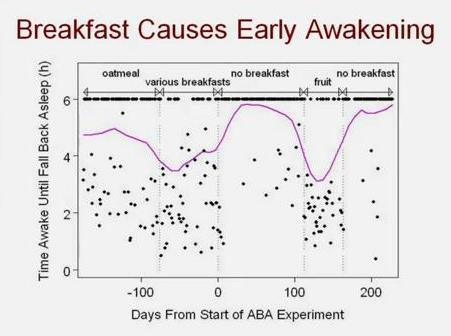 The one thing we know for sure is that feeding should coincide with daylight, if possible. Do you believe tryptophan-rich foods could help? If so, would evening be preferable? 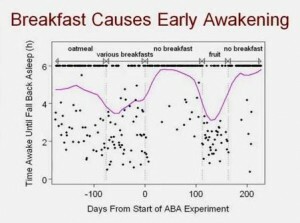 Seth wrote that eating animal fat, particularly bacon fat, improved his sleep. I know bacon has a high amount of tryptophan (not too sure about bacon fat, or butter or tallow, for that matter). Any advice for someone who works the nightshift? I get up at 11PM and go to sleep at around 4PM. I’m actually the opposite in that when I’m eating unhealthy and over weight I sleep great. When I start to eat healthy, currently on PHD, my sleep suffers. It’s not PHD because the same happened with Paleo or any other plans I’ve been on. No stress, following all principles: magnesium, darkness, schedule: intermittent fasting (eating 12-8) in bed by 10, waking at sunrise. Within 2 days of getting back on the “healthy” programs like clockwork I wake up 2:00 am and have trouble getting back. When I’m fat, 9/10 solid hours easy?? I would like to stay on my new healthy regimen, but I miss my sleep. What would you do if you suddenly developed severe insomnia and could not make it better? I’ve hardly slept in 3 months. 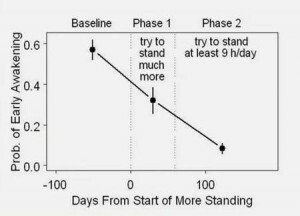 I follow PHD guidelines for diet; I am practicing IF, eating between 9 a.m. and 5 p.m.; and circadian rhythm entrainment guidelines are my natural lifestyle. For twelve years I’ve been a regular walker and hiker. Anxiety is not the issue. I’m not lying awake worrying or planning. Prayer is a big thing for me. I’m chill. At night when not sleeping, I remain in bed, do not turn on lights, and just try to put it in neutral. I am fortunately patient with stillness. I may repeat certain psalms and prayers. I try to keep it monotonous and restful. My first hunch is the insomnia may relate to perimenopause; though I am also hypothyroid, with adrenal insufficiency as well. For perimenopause I’m using Femmenessence, a maca product. Last winter it restored my sleep, but it doesn’t any more. For hypothyroid I’ve been in the process of adjusting my meds since April, plus my NP has me supplementing with Ashwaganda and Thyrosol for thyroid support. For adrenals she has me supplementing DHEA; my bloodwork showed it was low. She said my D3 levels were low in her opinion. (Despite supplementing.) So I’m supposed to switch to a liquid D3. She also said my iron was low in her opinion, so she started me on Gentle Iron (constipation is major & chronic). The FreetheAnimal people claim raw potato starch improves sleep but not for me. Recently I’ve been trying it. Am taking about 18g (some days I skip it because it stopped helping my constipation after the 7–12 days). One week I tried valerian root but without effect. Last night I tried tryptosan but never fell asleep. It’s like I’m ascending toward sleep, and the boat arrives, and just as I’m about to put a foot into it, the whole thing vanishes! Both boat and river. Like my inner light suddenly snaps back on. Not even sleepy any more. I use magnesium oil. I use epsom salt baths or footbaths from time to time. Lavendar oil doesn’t help either. I include safe starch at supper. I get ready for bed around 8:30. Four or five nights a week I manage to do a very relaxing exercise routine (to address flexibility and chronic neck pain) before bed. I think I eat enough calories. I’m experimenting. I was eating 2000+ when insomnia first started. Now I eat around 1750. I don’t feel hungry until it’s time. My whole adult life, my day’s calories were 2000-2500, weight about 118 (except around pregnancy or when in an avid bread/sugar phase). Now, unless I eat fewer than 1800 calories I get steady weight gain despite PHD. I’m 5’5″. God gives me joy, that’s the great thing I can report. Every morning about 5:15 or so I get up and take a walk under the stars and am glad to be alive. And even if I slept wretchedly I refuse to mope indoors. As much as possible I take my day’s work outside at some point. And I go to the woods 2-4 days/week. I still try to achieve at least 15 miles a week of walking and hiking. God is my strength! What could help me sleep? It sounds like you are very positive about your experience and that’s the important part. I started suffering from insomnia when I started IF. Just my opinion but if I was you I would just eat at a natural schedule by listening to your body’s cues. I also learned about Segmented Sleep, which I found interesting. For quite some time now, more so in history, it is considered quite normal to sleep in two phases. During pre-industrial times before everyone had light bulbs in their homes our rhythms were different. Our modern culture makes us feel abnormal if we wake up after a few hours, stay up for awhile and get another hour or two in the morning. Read this page, it’s quite interesting and may give you new insight as to what your normal is and you might find out they are perfectly fine. That’s a bummer. Sounds physiological. Have you tried stopping all supplements and medications? If you can sleep after a few days without them, then you can start narrowing it down by adding them back in one at a time. I’ve heard about choline, K2, vit. C, and iodine causing people sleep trouble. They don’t bother me, but everyone is so unique, it’s worth a shot. You could also try breathing the color pink mentally. Sounds weird, but it works for me. Prayer is a great way to sleep, too. At least your body’s getting rest and your mind is in a good place each night. I am absolutely exhausted and totally depressed. I am menopausal and have had abysmal sleep for 3 years, occasional sleeping pills mean the odd night of sleep but I limit myself to once a week. My joints hurt and I am totally foggy, my brain barely functions and I am between tears and rage so easily. I have gone from a busy active business owner and boxer, to a sedentary barely functioning anti social person who might only leave the house twice a week… all blood tests show nothing…. I have just ordered your book. I sleep in a totally darkened room, I am exhausted… Oh for some sleep and energy.